Richard Kelty likes to say that he started in the outdoor business in 1951 when at age 4 his parents and siblings put together Kelty packs in their Glendale, Calif., home. "My mother always said that I pissed all over the first set of Kelty pack bags,” Kelty said with a laugh. "That may be so, but I worked for Kelty Pack part time and during the summers until I was 16." Thoughts of the outdoor business faded into the background when Kelty enlisted in the Air Force. He was mustered out in 1970, and while attending college part time, began working at the Kelty retail store. The newly formed company was called Sierra West, and it started with a sewing machine and a bolt of fabric. The first product was a nylon-covered foam pad, which garnered them a good-sized order from Kelty retail boss, Larry Pearcy. "We got pretty excited and went out to see what else we could sell," Kelty said. Slowly but surely, Sierra West became known for its accessories, and by the end of their first year in business, the company had achieved $20,000 in sales. Sales continued to grow, and in 1973, Kelty and Scott moved the company to Santa Barbara, Calif. Once there, they took a chance on the then-new Gore-Tex fabrics. Kelty said, "We were the first manufacturer to wholesale Gore-Tex products." But not all was good with W.L Gore's first-generation of Gore-Tex. The 1,000 Gore-Tex jackets Sierra West made and sold to L.L Bean delaminated and were returned. Sierra West was also getting Gore-Tex jackets back from California hikers and backpackers who had had them delaminate in critical conditions. "The jackets became a liability," Scott said, "so we sent several of the ones we'd gotten back from Sierra hikers to Gore with a note reading, 'Make the product better quick." W.L. Gore eventually corrected the problem and sent representatives to visit Sierra West to see the company's fabric-testing facility. "Our lab was the men's bathroom at our facility," said Scott with a laugh. "VVe'd take Gore fabric, sew it into bags, seam seal them, fill them with water and then hang them up in the bathroom to see if they leaked. Needless to say, the Gore people were stunned when they saw our fancy testing facility." Despite this, Sierra West's Gore-Tex fabric outerwear took off at retail-and so did the price for the fabric. "When Gore raised their prices, we came out with our FAD - 'Fast And Dirty' some called it- line of less expensive outewvear," Kelty said. "The designs were very simple and they sold well. At the same time, we added tents and urethane-coated rainwear to our line." By 1977, Sierra West was selling Gore-Tex outerwear, the urethane-coated rainwear, down comforters, tarps, stuff sacks, sleeping bag straps, first-aid kits and more. Next on the drawing board was LITE (Lightest Imaginable Travel Equipment) Gear, the outdoor industry's first attempt at ultralight outerwear, daypacks, sleeping bags, and a frame pack. "The idea came to us when Rick created all this lightweight test gear for a weekend trip up Pine Creek Pass. He just cruised along effortlessly while we plodded with all our heavy gear," Kelty recalled. Scott added, "We started the LITE idea by using smaller packs and sleeping bags and soon we were cutting down all the gear. Traveling at high elevations in the Sierra with a 28-pound pack was a lot more fun than with a 55-pound pack." Sierra West cruised along nicely into the mid-80s when a Colorado River boatman named Gib Mann arrived at the company. “Gib dispersed the guide's term ‘big dog' throughout his conversation," Kelty said, "and he and Joy Moran designed a pair of huge, almost skirt-like, soccer shorts for Patagonia employee and soccer fanatic, Roger McDivitt. When we all saw the shorts, we kept saying, 'Man, those puppies are big.' So between those comments and Gib's use of 'big dogs' in his conversation, the Big Dogs shorts line was born." Big Dogs became an almost instant hit at specialty retail, and gained a following at the SIA trade shows in Las Vegas, where the company staged several epic Big Dogs dance parties at what was then Sin City's hottest dance venue, the Shark Club. But as good as things were at Big Dogs, Sierra West suffered a traumatic blow when it lost the Eddie Bauer private-label jacket business when it took it off-shore. Kelty said, "We'd been slow in considering off-shore and the Bauer decision forced us to look for new business, so we tried a Gib Mann-designed line of work- inspired clothes. The line got a lukewarm reaction." Eventually, Sierra West would go under in the late '80s. Soon after that, Scott and Kelty ended their partnership. Scott continued with Big Dogs, which later declared bankruptcy and was purchased by new owners. Scott stayed on for another five years in the marketing department. For the decade after Sierra West, Kelty and a partner ran a sunglass kiosk business, which they sold to the Sunglass Hut chain. Since then, he's been involved in the construction business. Looking back on his 19 years with Sierra West and the outdoor industry, Kelty said, "It was a tremendous amount of fun. I miss the camaraderie of those days." As for Scott, when Big Dogs' new owners expanded the company's retail presence, he left and got involved in real estate investing. While on vacation in Kauai nine years ago, he liked what he saw of the local real estate market and shortly thereafter moved his family to the island. Beyond the outdoor business, Scott and Kelty will always be remembered by industry old-timers and their Santa Barbara friends as being the vanguard of new ideas. Take, for example, their annual beach party during Santa Barbara's famous Fiesta. Scott would mix margaritas in his solar-powered blender (his home was powered by solar energy), while guests relaxed under a giant Kelty-created nylon parawing sunshade supported by 22-foot bamboo poles. This story originally published in 2008. Here's the introduction and index of Woody's Trailblazer stories. I worked for theses two in1987 at Sierra West. 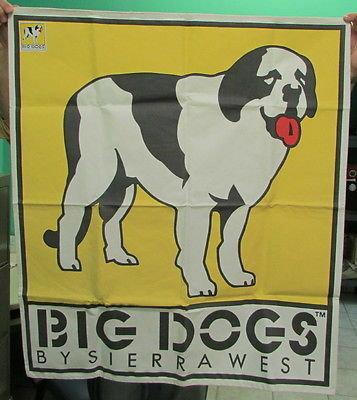 Big Dogs merchandise was just taking off then. It was a little hole-in-the-wall outlet store on Chapala street. Rick was a good guy, funny, down to earth and easy going. Richard on the other hand was condescending to me and some of the other employees. He accused me of stealing even though I never took a penny from him.